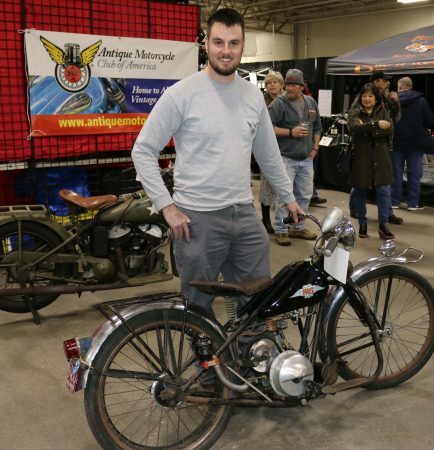 Attendees got to sit on new models from Indian, Harley-Davidson, Royal Enfield, Triumph and Can-Am, study some custom models and learn about motorcycling’s past at a display by the Yankee Chapter of the Antique Motorcycle Club of America. Mike Nichols of Palmer, MA brought a 1951 Simplex Servi-Cycle that he and his father picked up 10 years ago. 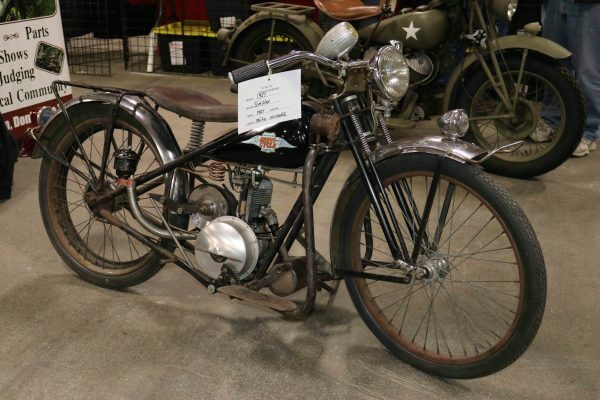 The Servi-Cycle was built in New Orleans, LA between 1935 and 1960, and looks like a cross between a bicycle and small motorcycle. 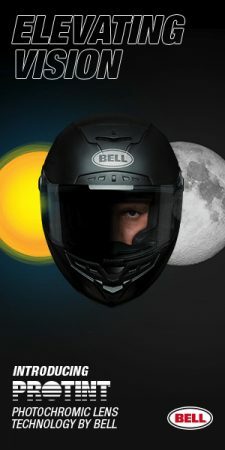 “I consider it like a motor scooter almost,” said Nichols. 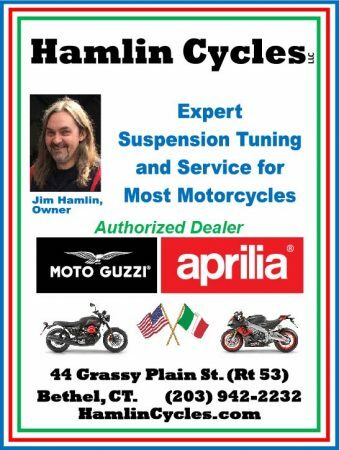 The Servi-Cycle is powered by a 125cc, two-stroke engine. 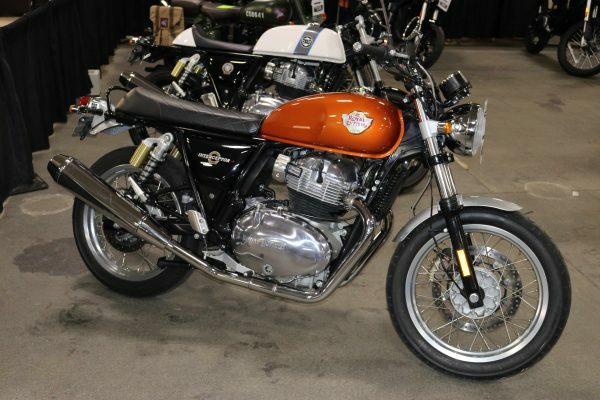 “It looks like a lot older bike than it is. 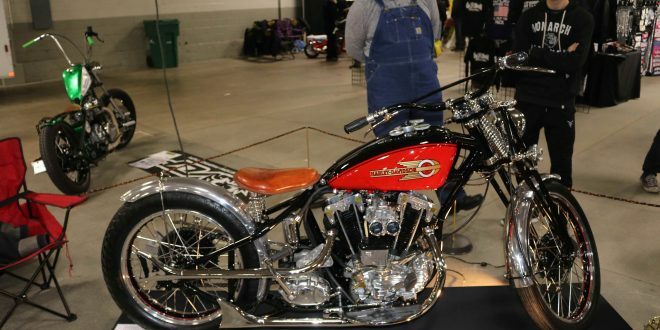 It looks like something out of the teens,” said Nichols, who reported that it usually only gets ridden on the grounds of vintage shows. “It’s not suited for today’s roads,” he said. 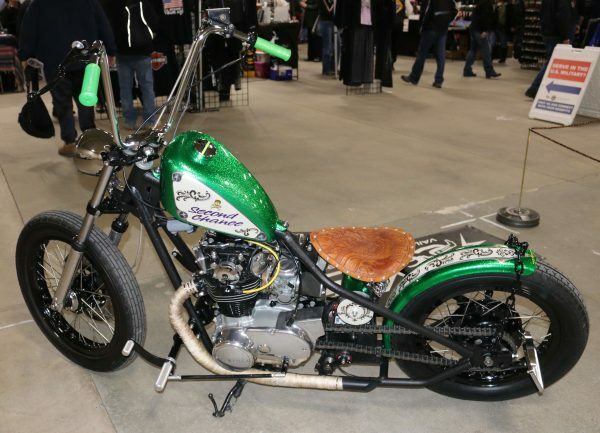 Over in the custom area, Kyle Vaill of Torrington, CT was showing off his one-off, bright green metal flake bobber that came off the assembly line as a 1976 Yamaha XS650. “It was my uncle’s and it had sat in his basement for years. I remember it as a kid,” said Vaill, who reported pulling it out in 2010. 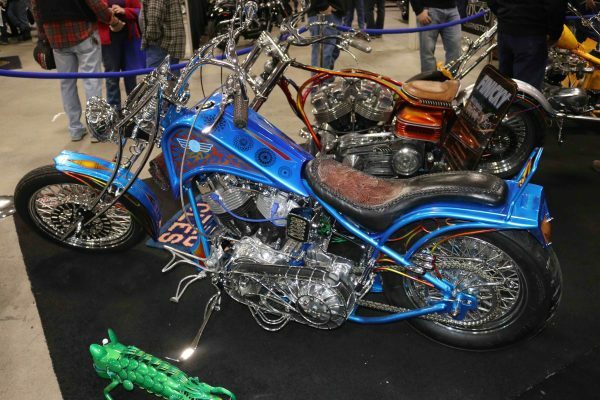 “I just wanted to build a little bobber. 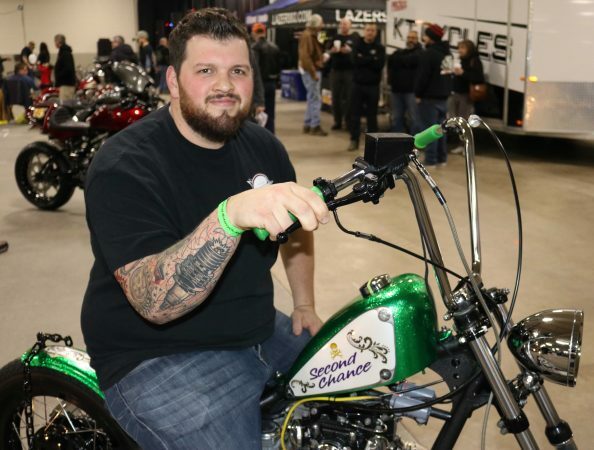 I wanted to keep it real simple.” It got named “Second Chance” because he gave the bike a second chance when he extracted it from the basement. 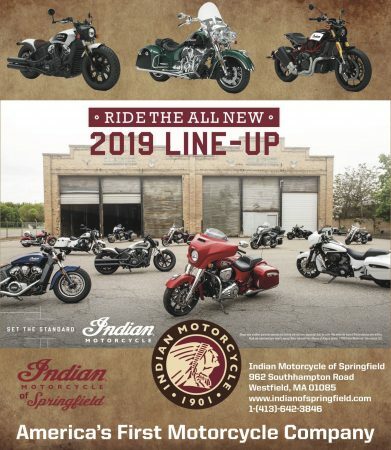 Dealers on hand for the show included Indian Motorcycle of Springfield, Harley-Davidson of Southampton and Mark’s Motorsports, which brought the new 2019 Royal Enfield INT 650 and the 2019 Can-Am Ryker. 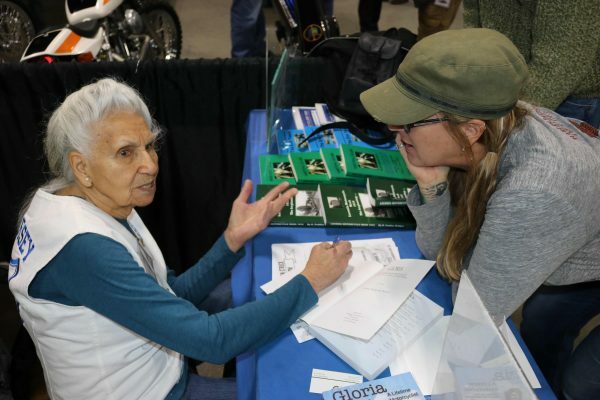 Celebrities on hand included AMA Hall of Famer and author Gloria Tramontin Struck and custom builder Ron Finch. 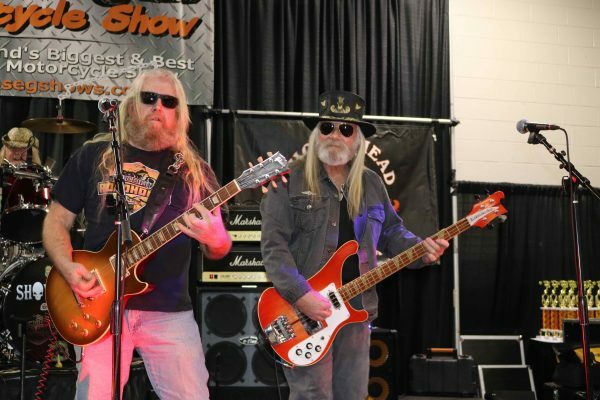 As has become tradition, Shovelhead provided the music for the 14th annual show, which Sousa said he started with the idea of appealing to all riders – no matter their background or model preference. “It’s becoming more achievable as the years go by,” he said. While turnout was strong for opening day, tomorrow remains a question mark, largely dependent upon how much snow falls tonight. “We’re open and we’re going to run,” said Sousa. 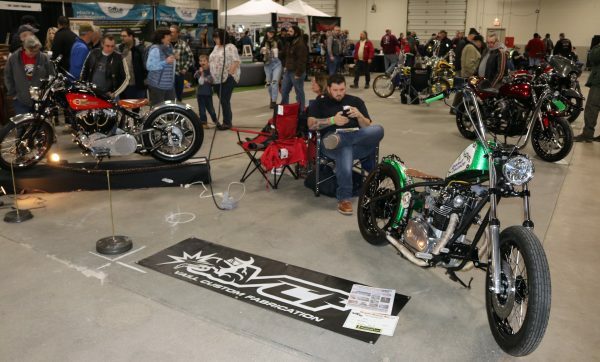 The Springfield Motorcycle Show is open until 7 tonight. 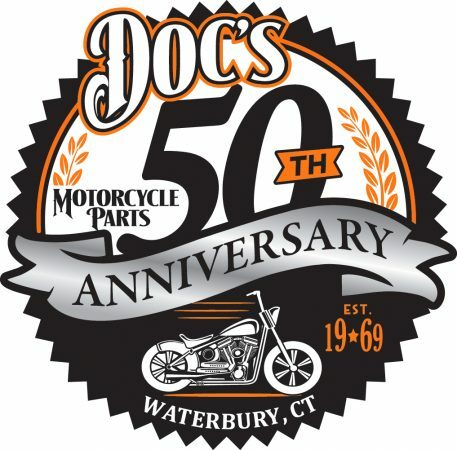 Sunday hours are from 10 a.m. to 5 p.m.